After working for the BBC for over a decade, I made a complete career change to follow my passions in health and fitness and the outdoors. As well as being a proud Nordic Walking Instructor, I'm a Cancer and Exercise Rehabilitation specialist, qualified triathlon coach and Personal Trainer. 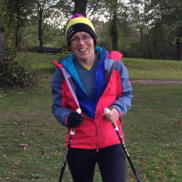 Nordic walking allows me to combine my love of keeping fit and being outside, whilst allowing me to chat away, discover new places and share my enthusiasm for being active with others. Away from Nordic Walking, I love racing triathlons, and co-host the popular Oxygen Addict Triathlon podcast. When I have time to relax, I really enjoy baking and I have raised over £25,000 for charity through my “Fuelled by Cake” recipe books. (Nordic Walking UK likes to keep everybody up to date with Events, Equipment and Nordic Walking News - please let us know if you would like to stay in touch). Welcome to our search facility to locate a NWUK Activity or Instructor near you. Please use the search function above entering the town name or post code. To search by County, please choose 50 miles radius. Please contact your local Instructor in person via the INSTRUCTOR search and they will be able to let you know what Activities they have available and what they charge.